SKYACTIV. The future of cars according to Mazda – Driven. You only have to drive a 20-year-old car to realise how much better cars are today. A Sierra felt pretty good in 1991. But compared to today’s Mondeo it feels almost prehistoric. So what will tomorrow’s cars feel like? To find out, we’ve been driving some prototypes. But first a word about exactly what we were driving. Most new cars are not completely new. Manufacturers almost always offer one new thing at a time: a new body, a new suspension system, a new engine, a new transmission. Maybe, if you’re lucky, two out of the four. Almost never a completely new car with completely new suspension and completely new engines and completely new transmissions. 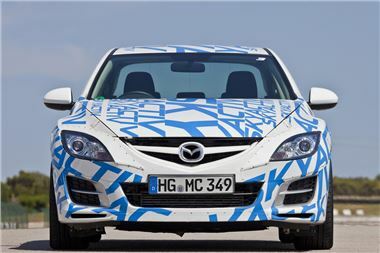 With its SKYACTIV programme, Mazda is the exception to this rule. Instead of redeveloping bits and pieces, it has redeveloped the entire car. And, rather than merely offer a few special SKYACTIV models, it is applying SKYACTIV technology to its entire range. Every manufacturer is also striving to reduce its corporate average CO2. Renault does it with four electric models and an excellent all-new diesel engine. Toyota does it with hybrids. So does GM. PSA will be offering hybrids and a sprinkling of small electric models. Mercedes and BMW are experimenting with hydrogen fuel cell vehicles. Honda and Hyundai/KIA have both hybrids and hydrogen fuel cell vehicles. Everyone, it seems, is fitting stop-start systems and regenerative alternators. Instead of taking those routes, Mazda is first looking at how it can reduce the CO2 and improve the economy of its entire range of cars, while improving rather than sacrificing their drivability. New body structures to save weight without losing strength, new suspension systems that improve both ride and handling, new engines that are both more powerful and more fuel efficient, new transmissions that save fuel and are more fun to drive. Every single major component has been re-thought to provide maximum driving pleasure with minimum environmental impact. We were fortunate enough to be invited to drive and comment on the results. 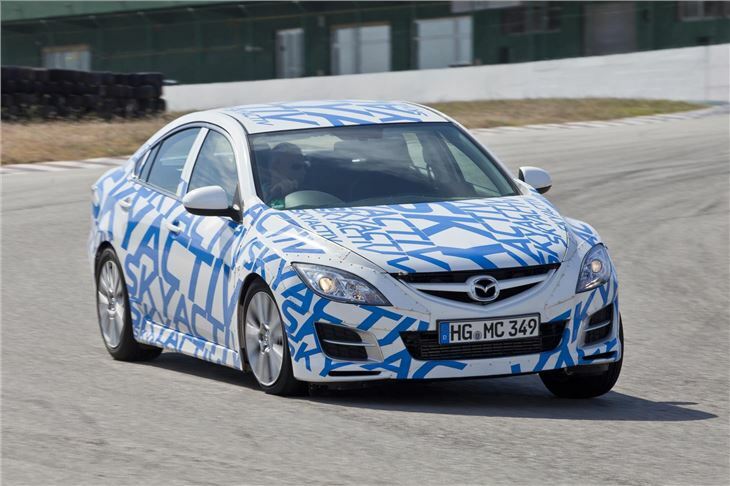 For a basic Mazda 6 size car, Mazda development engineers have managed to cut the body weight by 8%, yet at the same time make it 30% more rigid and even safer in a crash. The three elements of this were to optimise the structure, to enhance the bonding of the structure and to use more high tensile steel. Straightening the monocoque chassis, and using ring structures for the cabin saved 10kg. While adopting a ‘trident frame’ whereby impacts are fed into that straight structure improved safety in front and side impacts. 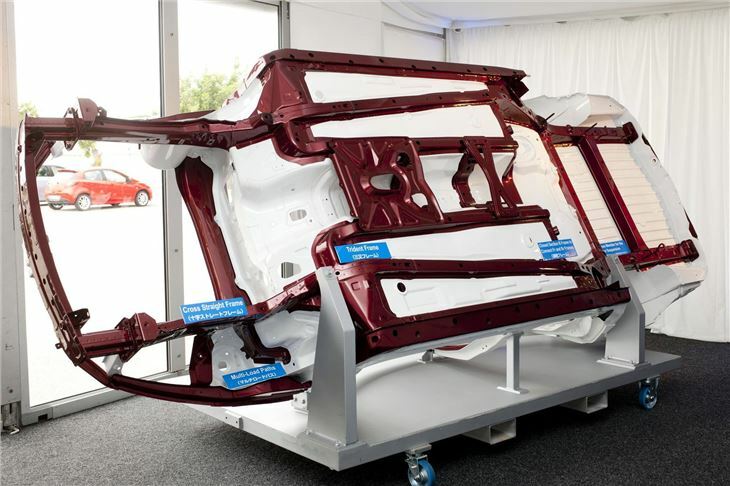 Increased numbers of spot-welds and weld bonding made the structure stronger as well as 5kg lighter. Using different materials including a greater proportion of high tensile steel saved a further 5kg. 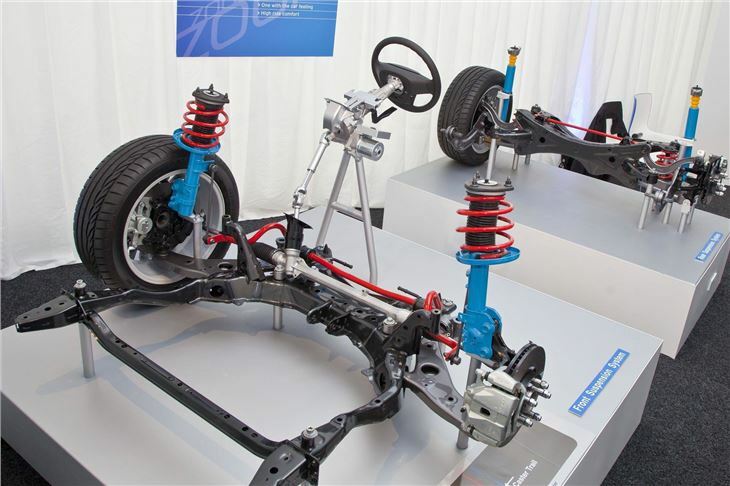 Underneath, the SKYACTIV engineers have reduced the weight of the suspension components by 14%, while at the same time improved the ride, grip, handling and steering feel of the car. A normal petrol engine has a compression ration of around 10:1. In a Ferrari F458 or a Formula 1 car, this is raised to 12.5:1. Mazda’s new 2.0-litre SKYACTIV petrol engine has a compression ratio of 14:1, the highest of any petrol engine in the world. The upsides of an extremely high compression ratio in a petrol engine are superior efficiency, more torque and better fuel economy. The problem would normally be uncontrolled combustion (or ‘knocking’) due to the return of residual gases from the exhaust manifold to the combustion chamber. Mazda overcame this three ways: By using a specially long 4-2-1 exhaust manifold to scavenge residual gases, by employing sequential valve timing to optimise mixture airflow and reduce pumping loses, and by employing longer piston stroke, narrower bores and a cavity in the piston crown to create a stratifies air-fuel mixture around the spark plug and promote smooth growth of the initial combustion flame. 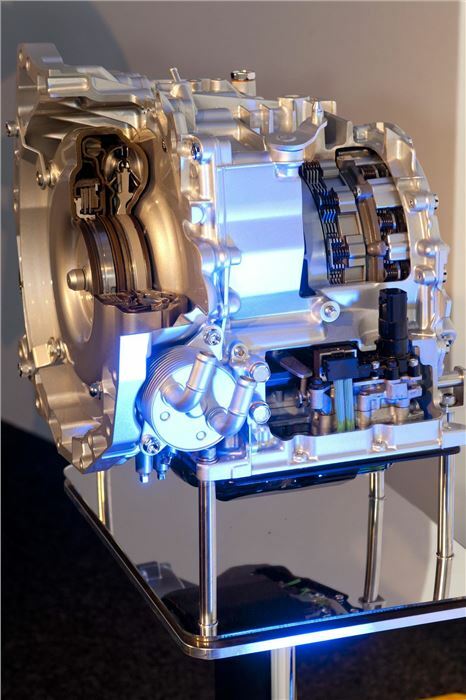 Additionally, a compact electronic variable pressure oil pump is employed (as in Renault’s new 1.6 dCi 130 diesel engine). The SKYACTIV petrol engine is 10% lighter with 30% less engine friction, uses 15% less fuel, emits 15% less CO2, and offers 15% more torque compared to the previous Mazda MZR 2.0 engine. The SKYACTIV diesel engine is even more interesting, appearing, on the face of it, to have taken the entirely opposite direction. Whereas, at 14:1 the SKYACTIV petrol engine has the world’s highest, compression ratio for a petrol engine, with the same 14:1 the SKYATIV diesel has the world’s lowest compression ratio for a diesel. Normal diesel engines with compression ratios of between 16:1 and 18:1 create extremely high pressures requiring them to be very robustly built and therefore heavy and ponderous. With a high compression ratio, ignition takes place before the ideal air-fuel mixture is formed, causing the production and emission of NO2 and soot. Ignition also happens after the piston has reached the top of its stroke. The lower compression ratio of the SKYACTIV diesel leads to decreased compression temperature and pressure. 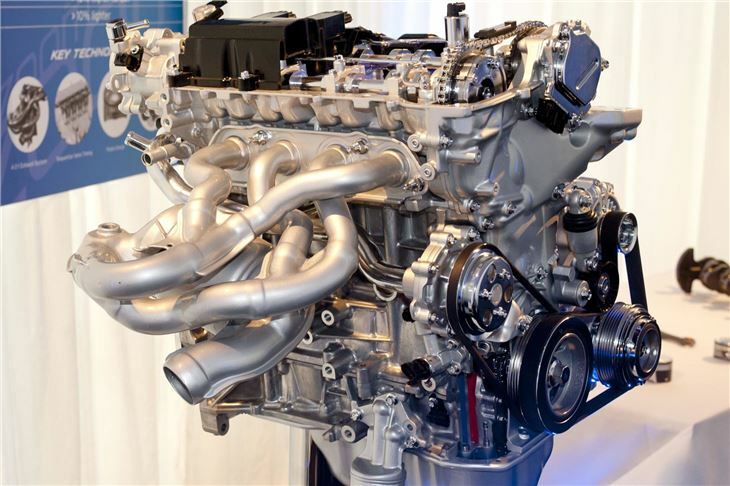 Therefore the components of the engine can be made much lighter, reducing combustion pressures by 20% and allowing a reduction of engine weight of 10% and allowing the engine to reach higher RPM. Lower compression also gives more time for the ideal mixture to form prior to ignition. And enables ignition to take place at the top of the piston stroke. The result is an engine that requires 20% less fuel, emits 20% less CO2 and also minimises NO2 and soot emissions. The downside of a low compression ratio, if not overcome, would have been misfiring after a cold start while the temperature in the combustion chambers remained lower than it does in a high compression engine. SKYACTIV engineers solved that one by employing multi piezo injectors, ceramic glow plugs and variable valve lift to the exhaust valves. These open slightly during the intake stroke causing hot exhaust gases to flow back into the combustion chamber to enable quicker heat up and stable combustion. Additionally, the lower compression ratio allows the exhaust manifold to be incorporated into the cylinder head, which therefore acts as an effective heat exchanger for the coolant circulating through the engine leading to faster warm-up. The two-stage turbocharger is bolted directly to the cylinder head exhaust manifold and the catalytic converter and diesel particulate filter directly after. The two-stage turbo offers greater torque and responsiveness at low engine speeds, and more power at high engine speeds. That’s 420Nm at 2,000 rpm (with 300Nm from 1,200rpm) and 175PS at 4,500rpm. 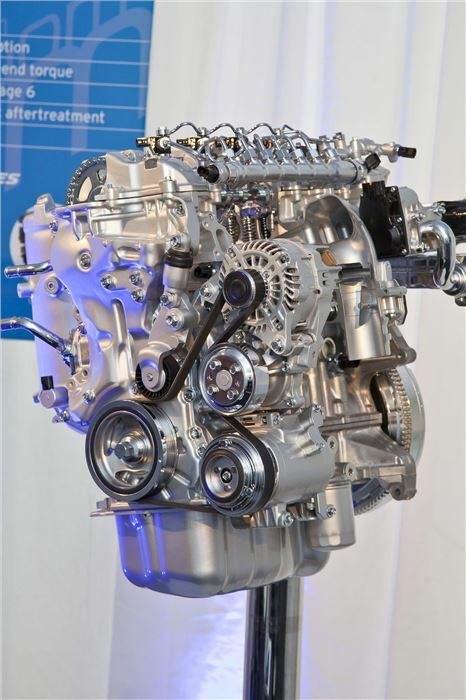 Because the SKYACTIV engine emits less NO2 and soot than a high compression diesel, the DPF can be smaller yet still qualifies the engine for the stringent forthcoming EU6 without a NOx trap. The SKYACTIV 6-speed automatic transmissions aim to combine the advantages of a manual transmission with those of an automatic without the downsides of poor economy and slurred shifts. They do this by using a very compact torque converter, a new type of mechatronics valve box and torque converter lock-up in all gears, not just 6th. Quick shifting is enabled by a fast response to changes in hydraulic oil pressure achieved by the hydraulic valve box, and downshifts take place faster than in a preselector twin shaft, twin clutch transmission. The only torque converter ‘slip’ occurs during start up and then very momentarily during gearchanges. Whereas a standard torque converter automatic has a lock up ratio of around 64%, SKYACTIV-Drive has an 89% lock up ratio. Fuel economy is improved by between 4% and 7%. The new SKYACTIV manual transmissions eliminate two input gears by using a common input gear for 1st, reverse and idling and a common input gear for 2nd and 3rd. The new manual transmissions are not only smaller and lighter, with increased torque capacity of either 270Nm or 460Nm, they also offer a crisp, sharp shift with reduced lever movement, giving them a direct sporty feel like the Mazda MX5. While, of course, the increased efficiency helps to improve fuel economy. We drove SKYACTIV diesel manual, SKYACTIV diesel automatic, SKYACTIV petrol manual and SKYACTIV petrol automatic. All worked well, but the most impressive was the diesel manual, offering smooth torque from very low rpm and a meaty slug of grunt at high speeds. Apart from the diesel clatter (these were prototypes with no soundproofing) it drove like a V6 petrol. 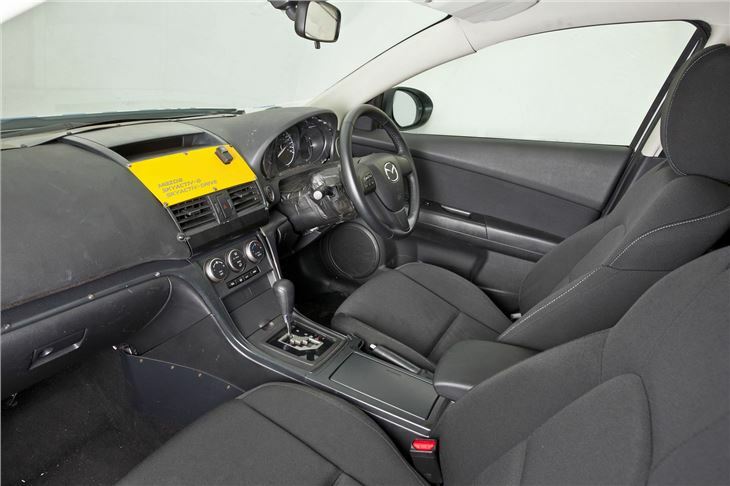 The SKYACTIV petrol engine offered astonishing smoothness, almost like a BMW 2.5 straight six, but obviously without the stump pulling torque of the SKYACTIV diesel. It was slightly difficult to assess the short shift of the manual, and the autos might have benefited from paddles rather than Mazda’s forward to change down, back to change up floorshift. The diesel auto had been programmed for the very tight race circuit we were using, which meant it held third in fully automatic mode longer than I did manually. What struck home most of all cars, though, was the feel of the steering, the faithfulness of the front end and the ride quality. Normally, given the types of corners, a front drive car would have succumbed to tyre howling understeer, but none of these did. Yet the suspension remained compliant and the ride comfortable. That really was an achievement. You have to remember that Mazda (now unshackled from Ford) is a relatively small company producing a mere 1,200,000 vehicles worldwide. So to embark on such an ambitious (and expensive) programme of improvement deserves the highest praise. And, of course, there is much more to come. With SKYACTIV, Mazda is equalling or bettering performance and emissions improvements without resorting to stop/start, regeneration or hybrid/electric standard technology. Stop/start, regenerative alternators and hybrid/electric will all bring yet further improvements to SKTACTIV as time moves one. The first full production product of SKYACTIV technology will be the new CX5 SUV arriving next year. LandRover has certified its two-wheel drive Evoque manual diesel with stop/start and regenerative alternator under 130g/km CO2, so £95 tax. The Mazda CX5 2WD manual diesel will be under 120g/km CO2, so £30 tax without stop/start or regenerative alternator.